Book your Lisbon Sailing Regattas and Nautical Activities! 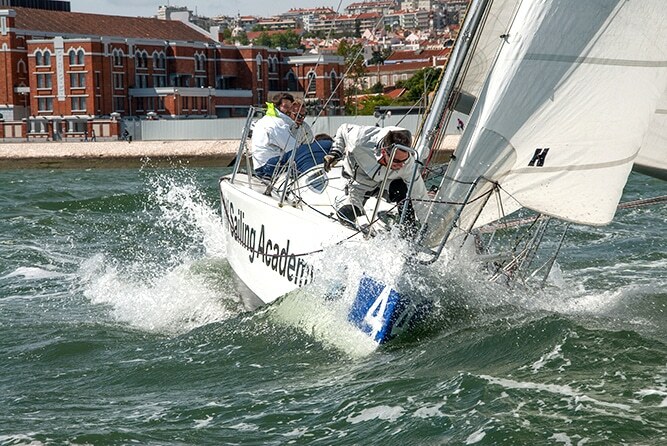 Lisbon sailing regattas and nautical activities are perfect for a special event! Why not challenge your colleagues to some fun competition on the water? We offer a variety of options to make sure you have a wonderful experience – no prior experience needed! Portugal, and specifically the River Tejo, is by nature an exceptional place for water sports, namely sailing. Featuring the biggest mono type fleet in the country, we create a regatta program (sailboat races) in which you will compete with your colleagues! By learning sailing techniques, you will enjoy racing to beat them to the finish line! We divide the group into teams of 7 and each team will step in one of our boats with an experienced and accredited instructor (trainer). We invite all participants to take part in controlling the boat, providing a unique experience and a feeling of personal accomplishment, which motivates all participants to give their best! Water Balloons!…… Sailing!……….. Battleship!………. You may have experienced one of this activities or even all of them, but………..have you ever tried them all together??? We invite you to come and experience this fantastic event! It all begins with the division of the groups in two teams (each team composed by smaller groups of 7 people) either pirates vs corsairs, or portuguese armada vs french armada, etc. After a small technical briefing, we set out to teach each team how to sail -then the Regatta begins! And in the middle of the racing field there is the “war zone”; the only location where the teams are allowed to engage in “battle”. The team that finishes the course first will be the victorious team. The GPS Challenge is an exercise used in Team Building programmes for companies. We hide a certain number of items in the Tagus River that must be found and (each team must find at least 2). The same item can be circumvented by not more than 2 teams. Before beginning the activity, we offer explanations as to how to find these items with nautical charts and gps. Objectives and goals are established within each team to promote work, communication and planning. How can I make my event even more special? Publicity – add your company logo on to a variety of sails and flags! Or even have t-shirts made for each team! Prizes – choose from a variety of option, including fun trophies! Catering – why not make a day of it and enjoy a meal by the water? Contact us with your requirements and we will tailor a Lisbon Sailing Regattas and Nautical Events package that’s perfect for you! Are Water Sports not really your thing? Not a problem! Because we want to ensure your activity is popular with your whole group, we also offer a variety of on land teambuilding and group activities in Lisbon, Cascais, Belem and Arrabida!